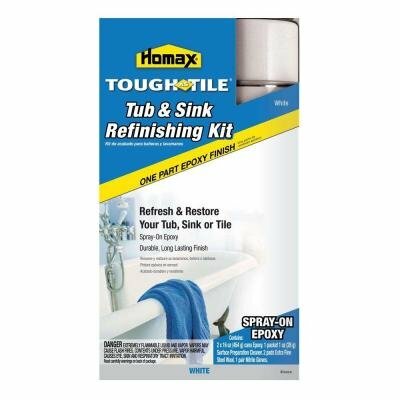 You no longer have to live with your old, stained or discolored tub or sink! The Homax Products 32 oz. Tough As Tile Aerosol Epoxy is a high-gloss porcelain repair product used to refinish tiles, sinks and bathtubs. Now with a little effort prepping and painting over one weekend, you can restore your tub or bathroom tiles to look like new. The Tough as Tile provides a hard, protective finish that remains beautiful for years - even on surfaces subject to severe or frequent washing. The Kit includes Tub, Tile & Sink One Part Epoxy Paint, Nitrile Gloves, Steel Wool, Surface Prep Cleaner and complete instructions. The results and savings are worth the effort.